Here is a list of Frequently Asked Questions (FAQs) about our services. If you have any other questions please do Contact us. Renting - How can I find out what properties you have available to rent? Visit our Places to Live page to find out what properties we have available. If there are no properties available please email us your details so we can keep them on file should a property come available. You can email us at market.rent@goldinghomes.org.uk. Please let us know the names of all applicants, job titles, level of income, property size required, availability to move, and whether you have any pets. Renting - Do you accept Housing Benefit? No, unfortunately we do not accept Housing Benefit. We undertake referencing and affordability checks through an independent company. For more information on the level of income required and the benefit payments that can be taken into account please view our Renting a Home page. Renting - Do you accept dogs in your properties? In some circumstances we will consider renting to households who have dogs. A non-refundable payment of £300 is required if we do accept a pet into a property. The Tenancy Agreement states that a customer must seek our consent before getting a pet. Garages - Where can I find what garages you have available to rent? We own and manage over 1500 garages in Maidstone and the surrounding areas. To find out more information about renting a garage from us visit our Garages page. Shared Ownership - I am selling my property. Why do I have to have a valuation done by a Chartered Surveyor? This is provided for in your Lease and is to ensure that a true open market value is determined so that you get the true price of your equity share. Shared Ownership - How will you market my property? We will advertise your property on the Help to Buy Agent’s website, Golding Places website and we may also contact our Sales Agents, who hold a database of potential purchasers for properties Golding Places may be marketing with them. Shared Ownership - How long does a resale take? We would normally expect the resale to complete within 3 months during the period that the valuation is valid; however there are occasions when it may take longer. Shared Ownership - What is the minimum share I can purchase? You may increase your ownership in separate stages or one stage to 100% (depending upon the restrictions in your lease). The minimum share you can purchase is 10% of the unsold equity. You may only be able to staircase a maximum of three times. 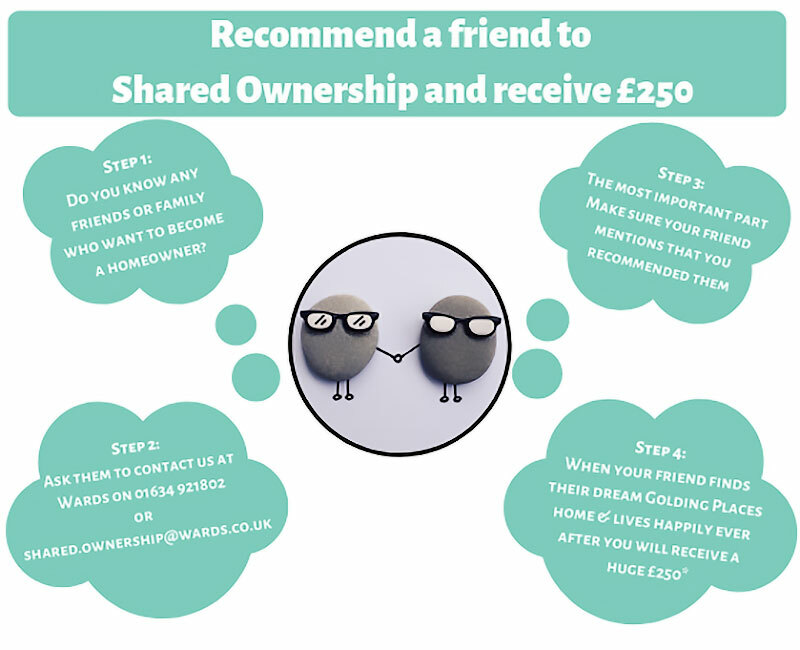 Shared Ownership - What if I have made improvements to my shared ownership home and want to buy more shares? The current market value of your property is determined by the Surveyor. We will also receive a valuation figure disregarding the uplift in value of the property due to any improvements you have made; this is the value we use to calculate the cost of the additional shares you wish to purchase. Stair-casing - What costs will I be expected to pay for stair-casing? We do not charge an administration fee for processing your stair-casing application. However, you will need to pay the cost of the valuation, your legal costs and any costs imposed by your mortgage company. Please refer to the Shared Ownership Administration Charges Guidelines and Fees on our Shared Ownership page. Commercial - I would like to rent a premises for my business, what do I do? Please contact us to find out if we have any commercial units available to rent. You can call us or send an email to commercials@goldinghomes.org.uk. Please let us know the details of your business and what your current situation is, i.e. have you got an existing business or do have you a history of running a business, etc. Commercial - How do I pay my commercial rent? The majority of our commercial leases stipulate that rent is due in advance of every quarter – 1 April, 1 July, 1 October and 1 January. In some circumstances we will agree that you can pay by a monthly Direct Debit. Leaseholders - I have a question about my service charge estimate or actual bill, who do I contact? Our Residential and Commercials Lettings Officer will be able to help you with your enquiry. You can call them or email at lease.enquiries@goldinghomes.org.uk. Leaseholders - How do I pay my service charges? As a leaseholder you can pay your service charges in full in April when you are sent the estimated bill. Alternatively you can pay monthly over 12 months, by Direct Debit. We also accept this payment by Standing Order and monthly cheque. Leaseholders - What can I do if I am concerned about paying a Major Works bill? We understand that major works bills can be sizeable and ask that leaseholders make financial provision for works that may be undertaken in advance. When you receive the invoice you can pay in full, or monthly over a twelve month plan from the date you receive the invoice. Further information on paying major works bills can be found by visiting our Residential Leaseholders page.